puppetry with your puppet team or for yourself? 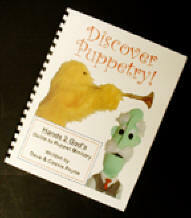 Hands 2 Grow now offers its popular booklet from their Discover Puppetry! Workshops to our friends interested in growing in their puppet skills. Discover Puppetry: A Hands 2 Grow Guide to Puppet Ministry is chock full of photos (some pages full color) and advice that will be invaluable as you look at starting your puppet ministry or training your team. Topics cover puppet care, proper technique and posture, staging, sound, finding script material, resources, and much more. If you can't get to one of our workshops, this is next best thing! Cost is only $7.50 plus a shipping/handling fee of $2.50. Please make your check for payable to Hands 2 Grow and mail it (along with your address & the specific volume you are ordering) to . . .
Be sure to include your name and address so we know where to send it!